Given a recent headline United Methodists could be forgiven for assuming the UM Church’s financial position is not just on solid ground, but that it has been setting records the past several years. However, since the article fails to properly contextualize this “record,” it gives the impression that, at least financially speaking, all is well for the UM Church. A number of our readers wondered how this could be the case given all the turmoil in the denomination and reports of local churches withholding apportionments or even leaving the general church. What follows provides some context for the UMNS article. First, just as every local UM church is annually apportioned a sum of dollars it is expected to send to its annual conference, so each annual conference is apportioned a sum it is expected to pass on to the general church. And just as not every local church pays 100 percent of its apportionments to the annual conference, so not every annual conference pays 100 percent of its share to the general church. Second, the UMNS article fails to report that the amount of dollars apportioned to the U.S. annual conferences has fallen significantly over the past ten years, especially when adjusting for inflation. In 2008 total funds apportioned to the U.S. annual conferences reached a high of $151 million annually, compared to just $144.5 million in 2017, for a decline of 4.5 percent. Adjusted for inflation, apportioned funds to annual conferences would had to have been $171.9 million to equal the amount apportioned in 2008 in purchasing power. Third, in early 2016, based largely on the denomination’s flagging membership and its accelerating decline in average worship attendance, the denomination’s General Council on Finance and Administration (GCFA) recommended slashing the general church’s quadrennial budget from the initial estimates it had proposed. The delegates at the 2016 General Conference ended up approving an essentially flat line budget: $604 million dollars for 2017-2020 vis-à-vis $603.1 for 2013-2016 (by comparison, the quadrennial budget adopted for 2009-2012 was $642 million). Therefore, since 2012 many annual conferences have seen their apportioned share decline or remain stagnant. It is not surprising then that over the past five years several more conferences were able to pay 100 percent of a reduced apportionment sum, especially as the overall economy strengthened and the unemployment rate declined. For instance, in 2012 the Indiana Annual Conference sent $5.1 million to the general church, and yet it was $100,000 short of paying 100 percent that year. In 2017 the conference gave just shy of $5 million, but since it was apportioned a lesser amount vis-à-vis 2012, it was part of the “record giving” the UMNS headline recently celebrated. The record the UMNS article trumpeted is akin to a teacher who cheerfully reports to his principal that this year six more of his students received an A than did so last year. He neglects, however, to tell her he actually lowered the mark for achieving an A. More important than how many U.S. annual conferences paid 100 percent is the total amount of dollars the denomination actually received from them (they account for 99 percent of total revenue from all conferences worldwide). U.S. annual conferences gave $132.8 million in 2017 for a 1.5 percent increase over 2016 ($130.8 million). 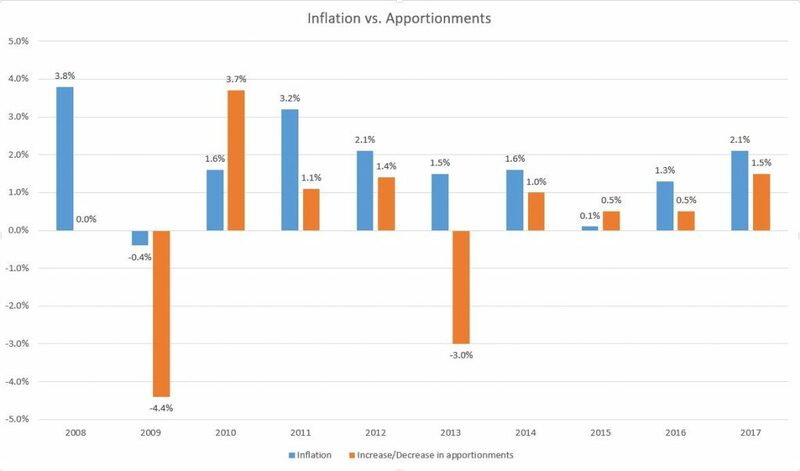 The 1.5 percentage increase is much better than 2016’s paltry rise of 0.3 percent over 2015, but it still lagged behind the 2.1 percent inflation rate for 2017. The U.S. annual conferences gave $130.2 million to the general church in 2008, so over ten years giving rose just $2.6 million. Had it only managed to keep pace with the low inflation rate over that period it would now equal $148.5 million, not $132.8. In short, giving from U.S. annual conferences continues to fall despite an expanding economy, low unemployment, and an inflation rate that has been remarkably low over the past 10 years. No one expects or even wants the GCFA and the UMNS to be advocates of gloom and despair. However, it is important for people to have a comprehensive understanding of the denomination’s financial status. By all means, celebrate the conferences paying 100 percent of their apportionments, but United Methodists should also know that smaller budgets, falling revenue (especially when adjusted for inflation), decreasing membership, and precipitous declines in average worship attendance indicate the church faces serious challenges no matter how many annual conferences pay 100 percent of what they are apportioned. This reality underscores that the UM Church faces significant challenges quite apart from irreconcilable differences around its sexual ethics, definition of marriage, and ordination standards. Walter Fenton serves on the staff of the Wesleyan Covenant Association. He is an elder in the Greater New Jersey Annual Conference.